Since Movemeant was founded in November 2014, they’ve had their fair share of trials and tribulations, yet they’ve managed to grow and thrive despite their setbacks. Movemeant’s goal is to reframe and redefine what fitness and health looks like for young girls. We recently cohosted a webinar with Charina Lumley, Chief Operating Officer of Movemeant Foundation, to get her advice on how a startup nonprofit can learn from their tough lessons and successfully grow their organization. Charina walked us through how the Movemeant Foundation adopted an entrepreneurial mindset, focused on data, worked to build their brand, invested in their staff, and learned from experts to grow their organization. Here, we dive into our favorite takeaways from Charina’s presentation. For even more useful insights, watch the webinar below. To think like an entrepreneur requires constant learning. Movemeant quickly learned that in order to succeed they had to ask questions. And not just a few questions; a lot of them, and to everyone they could think of. Whether it was tweeting Oprah’s best friend a question, sending a letter to Michelle Obama, or emailing Kate Hudson’s publicist, Movemeant didn’t shy away from reaching out for advice. How can we grow this program? How can we make our hard work pay off? When they took the time to answer these questions they prepared themselves to reboot their program for the better. Today, ambassadors are better equipped for success by having clear communication on expectations and benefits detailed before they apply for the role. A little data goes a long way. Data gives organizations the evidence needed to approve or refute their intuition. This was especially true for Movemeant as a startup nonprofit that needed to establish benchmarks. In order to make the most of their data, they first needed to have a clear understanding of how their organization would measure success and how that data would help make decisions for the future. Just as a for-profit businesses does, Movemeant found it important to look at their margin, income, and profit to measure their performance. Next Movemeant consolidated their data into one central location. By centralizing data, Movemeant is able to have reliable reporting as they grow and scale. Now with their data in one convenient location, they can see donor specific metrics, communication metrics, and high-level development metrics side by side to better inform decision making. After looking at our competitors, we decided we were going to break through gender norms. We made a cognizant decision to operate in the scope of what our benefactors are listening to and watching. After Movemeant developed their brand identity, they worked to expand their brand presence by identifying strategic partnerships. Each of their partners has a strong connection to the health and fitness industries, allowing both parties to benefit by being introduced to new donors/customers who fit the demographic profile they’re targeting. SoulCycle is just one of these partners who also promotes positive body image through fitness and movement. Movemeant’s partnership with SoulCycle not only exposes them to new individuals, but also helps them raise money through classes led by their inspirational instructors. Movemeant is a firm believer that you can’t change lives if you aren’t taking care of your staff. Taking care of their staff requires investing both time and money in their employees. But many nonprofits find the public has a hard time trusting NPO’s with how they use their funds. The public wants to know exactly how donor dollars are being spent. New Story Charity has answered the public’s question by being completely transparent about how they spend their money. They have set up two bank accounts: one for impact and the other for administrative costs. Donors then have the choice to raise funds for administrative costs or impact initiatives. This model inspired Movemeant to also raise money to cover administrative costs. They’ve since built a deck that they present to investors on why they should invest in Movemeant’s staffs’ salaries to eliminate the need for individual donors to contribute to this overhead expense. Albeit comically, Movemeant looks no further than to Justin Timberlake for inspiration. You’ve likely heard of the famous *NSYNC singer, dancer, and actor. What you might not know are the other ways he keeps busy: co-owning MySpace, AfterMaster, and a fashion line. Justin TImberlake inspires Movemeant because his diversified portfolio makes him self-sustainable. Should one initiative of his fail, he may rely on many others. The same goes for Movemeant—they’re working to diversify their revenue. This means instead of putting all of their eggs in one basket, Movemeant creates multiple revenue streams to avoid relying on one source for fundraising. They can’t predict which way the market is going to shift, but what they can do is protect themselves against the inevitable shift by diversifying their revenue. Movemeant’s tips and tricks for startup nonprofit success don’t end here. 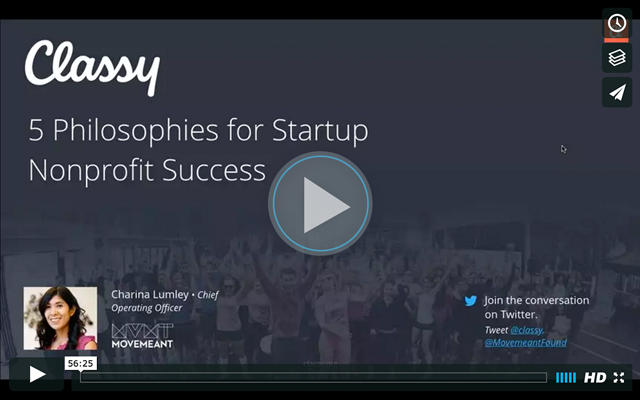 To gain even more valuable advice from our startup nonprofit expert, watch the recorded webinar below.